Clean learning helps in itself! It is much easier to teach and be taught in clean rooms! Wherever people meet on a daily basis, it is important to clean hygienically challenging zones in a reliable and thorough manner. 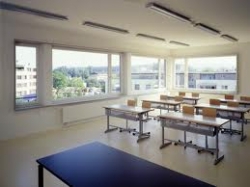 But the work spaces of teaching and research staff will also have to be maintained in order to ensure a productive working climate, and seating in seminar and classrooms may have to be rearranged. All works/ duties will be listed in a jointly compiled specifications sheet, which will serve as an audit and order document. • Intermittent cleaning of windows, blinds, floors, ceilings, carpets, facades, technical rooms etc. We guarantee an extremely high level of cleaning quality at an affordable rate.